Is a more emotional design enough to make the new Toyota Camry exciting? Toyota’s all-new 2018 Camry debuted at the Detroit Auto Show with a more emotional design. The Japanese company promises it infused its hot-selling sedan with more character, performance, and style than ever before. The eighth-generation Camry shares its Toyota New Global Architecture (TNGA) platform with the fourth-gen Prius. The new bones allowed designer to give the Camry a lower center of gravity, which translates to improved handling and stability as well as a more planted, low-slung look. Visually, it breaks all ties with its predecessor and adopts a sculpted hood that’s over an inch lower, a distinctly styled bumper that emphasizes the front end’s width, and a prominent Toyota emblem positioned in the middle of a wing-shaped grille. 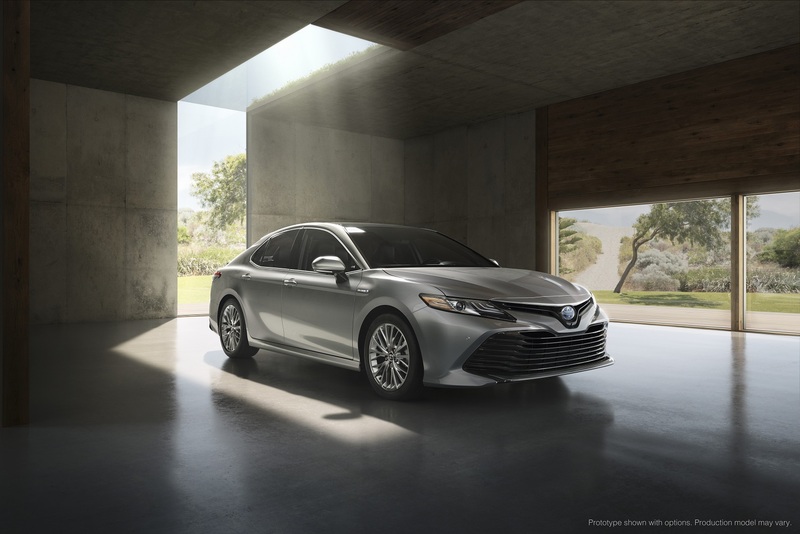 The roof line is sleeker than ever before, and the Camry’s back end receives horizontal tail lamps connected to thin vertical vents cut into the bumper. Select trim levels can be upgraded with a trunk-mounted spoiler and an air diffuser integrated into the rear bumper for a decidedly sporty look. Toyota’s design team was told to create a sedan recognizable from 200 yards away, and they’ve succeeded. Clearly, the Camry can no longer be qualified as a boring, milquetoast sedan. The stylish design continues inside with a pronounced character line that runs across the center console. The infotainment system’s touchscreen and an array of buttons, switches, and knobs are found on the driver’s side of the line. Phone-like icons make navigating the infotainment system a breeze even for new users, according to Toyota. Key information about the Camry and its surroundings is displayed either on the seven-inch screen integrated into the instrument cluster, or on the 10-inch heads-up display. High-tech features like the head-up display are optional, as is generally the case in this segment, but safety comes standard. Every Camry regardless of trim level comes with 10 airbags, pedestrian detection, adaptive cruise control, a lane-departure warning system, steering assist, and automatic high beams. Three powertrains will be available at launch. The Camry’s base engine is an all-new, 2.5-liter four-cylinder that’s bolted to an eight-speed automatic transmission. Next up is a 3.5-liter V6, and fuel economy-conscious buyers can order a gasoline-electric hybrid drivetrain that shifts through a continuously variable transmission (CVT) with six preprogrammed virtual gears. Additional technical specifications haven’t been released yet, though Toyota promises the Camry Hybrid will achieve Prius-like fuel economy. Built in the United States, the 2018 Toyota Camry will be available in four trim levels: LE, XLE, SE, and XSE. Sales will kick off this summer.